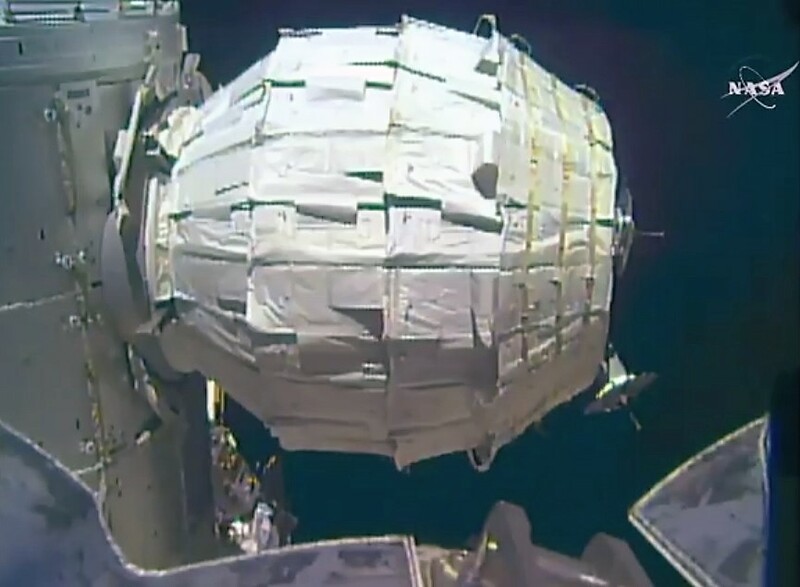 It took almost eight hours, but NASA accomplished the first expansion of a pop-up module at the International Space Station today, by inflating the Bigelow Expandable Activity Module, or BEAM. BEAM was built for NASA by Nevada-based Bigelow Aerospace under the terms of a $17.8 million contract. It was sent up to the station last month in the unpressurized trunk of a SpaceX Dragon cargo capsule. In its folded-up form, the cylinder-shaped module measures only 7 feet long, but when it’s pressurized with air, it can grow to twice its size. NASA astronaut Jeff Williams started the job of filling BEAM with air on Thursday, but it was tough going: The module grew by only a few inches before NASA had to call off the operation for the day. Mission managers surmised that the reinforced fabric on BEAM’s exterior had gotten stiff during prolonged storage. That led to “increased friction between the various layers … which is possibly causing this whole expansion process to just unfold a little bit slower than all of the initial predictions,” NASA spokesman Dan Huot said. NASA let the fabric relax on Friday. Today, the pace was just as slow as it was two days earlier, but steadier. This entry was posted in GeekWire and tagged BEAM, Bigelow Aerospace, International Space Station, Space. Bookmark the permalink.